make positive, lasting changes in your own home, starting today. There is hope for your home. Even if you've tried and failed a million times before, you can make positive, lasting changes, and I'll teach you how! Do you ever wish that someone would come over and help you make decisions about your belongings? Wouldn’t it be nice if you could find what you need when you need it? 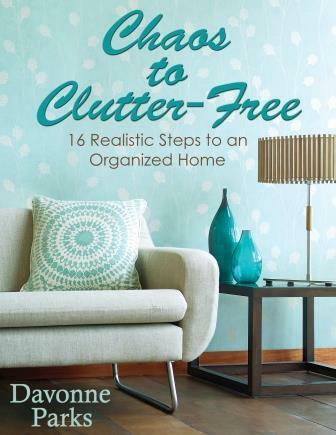 "Chaos to Clutter-Free: 16 Realistic Steps to an Organized Home" is just that— virtual hand-holding as you declutter your possessions. Plus, if you implement the steps provided, you’ll no longer panic and hide when unexpected visitors come knocking on your door. From inspirational quotes, to tips and encouragement, to simple maintenance plans and embarrassing stories, Chaos to Clutter-Free is a simple and realistic guide for restoring (or finding) order in your home. No area is left uncovered as you move step by step and room by room through a complete home-decluttering process. If anyone knows what it’s like to fail at housekeeping, it’s me. I used to feel as if I were drowning in clutter and couldn’t find my way out. Our many possessions no longer felt like a blessing to my family, but a burden. I’d desperately think, There has to be a better way. But I felt unable to find that better way. If anyone called to say they were stopping by (or worse, just showed up), I’d panic. If we planned for company, I drove my family crazy as I frantically cleaned. I knew I needed to change my housekeeping ways, but I’d tried and failed so many times that I just wasn’t sure how to create a lasting change. I finally realized, however, that since I was the one who let my home get into that mess, I was the one who needed to clean my way out. I knew that drowning in clutter was keeping me from doing more important things. I rarely opened my home to visitors because it felt like too much work. I was almost always late because I couldn’t find things like shoes, keys, and clean outfits. And I couldn’t spend much time serving others because so much of my time was just spent putting out clutter-fires. So I worked, and I worked hard. The payoffs have been immeasurable. I know your heartache. I understand that letting go of your things is tough. But you know what else I know? I know that you don’t always have to live this way. You can be free. Plus, as a bonus, a few chapters even include a short embarrassing story about the author! Written by someone whose own home has gone from chaotic to clutter-free, the author understands how difficult, discouraging, and energy-zapping clutter can be. But she also knows this: no matter where you are in life, and no matter how disorganized your home currently feels, there is hope. "Chaos to Clutter-Free" reveals the hope so that you can make positive, lasting changes in your own home, starting today.